AMM-Two Million Miraculous Medals – Help Us Reach Our Goal! Blog Home > Category > What's New > Two Million Miraculous Medals – Help Us Reach Our Goal! 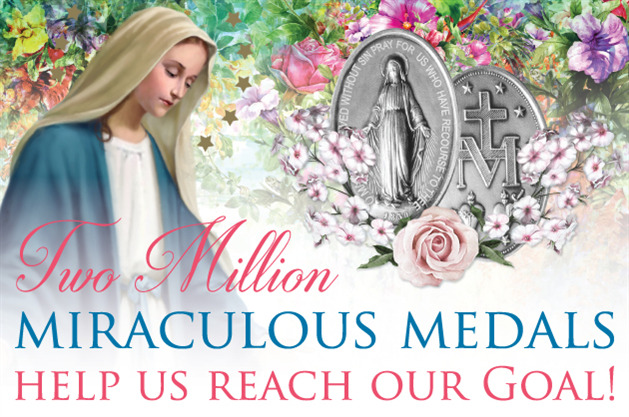 Two Million Miraculous Medals – Help Us Reach Our Goal! Three years ago the Association set and achieved an ambitious goal of distributing one million Miraculous Medals as a gift presented to our Lady on her birthday, September 8. This year, as a way of beginning the Association’s next 100 years of service, and with the power of so many great members, we are setting a new goal of distributing two million Miraculous Medals by our Lady’s next birthday. We hope you will join us in our efforts. Read Fr. Kevin’s letter about the hopeful message of the Miraculous Medal.